I've been noticing in the past several months a rear noise, like something's happening in the rear when I make some turns, something I could feel and hear. I don't think it's drive shaft related as I don't hear this going off straight forward or in reverse. 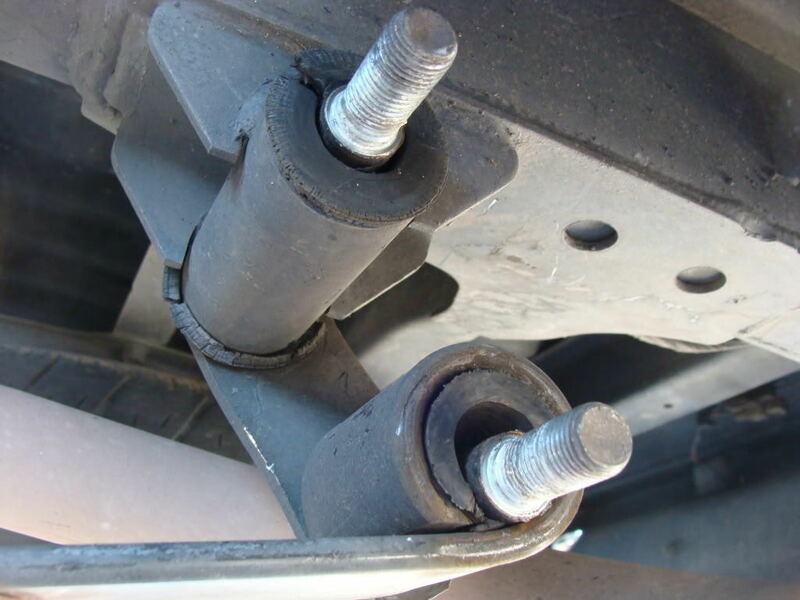 But I've noticed that the leaf springs rear lower bushings are shot. 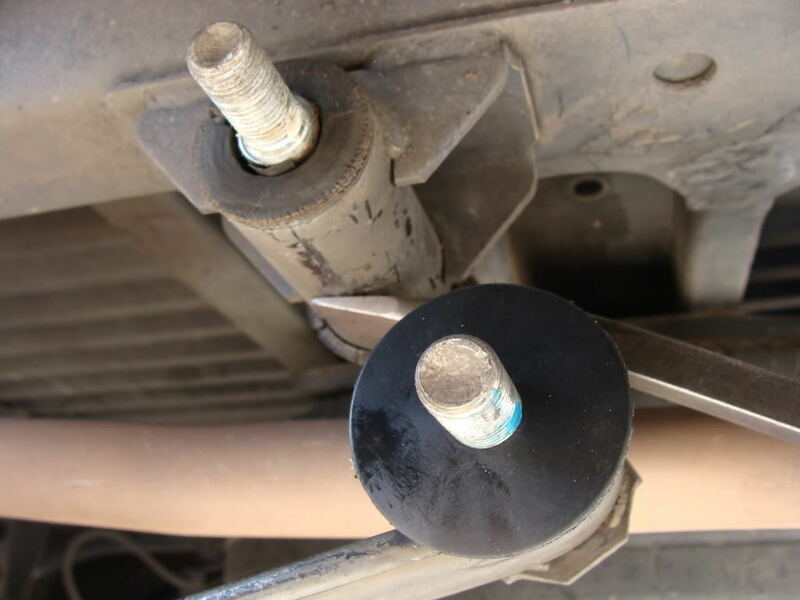 I was trying to track down source/part numbers for the B2200 leaf spring bushings. So today I figured I'd take a better look-see. And I shot some photos for Earl. How it looked. No rubber showing on the one side. The other side of same one at least showed some rubber. With the shackle plate off, look at the gap in my bushing !!! 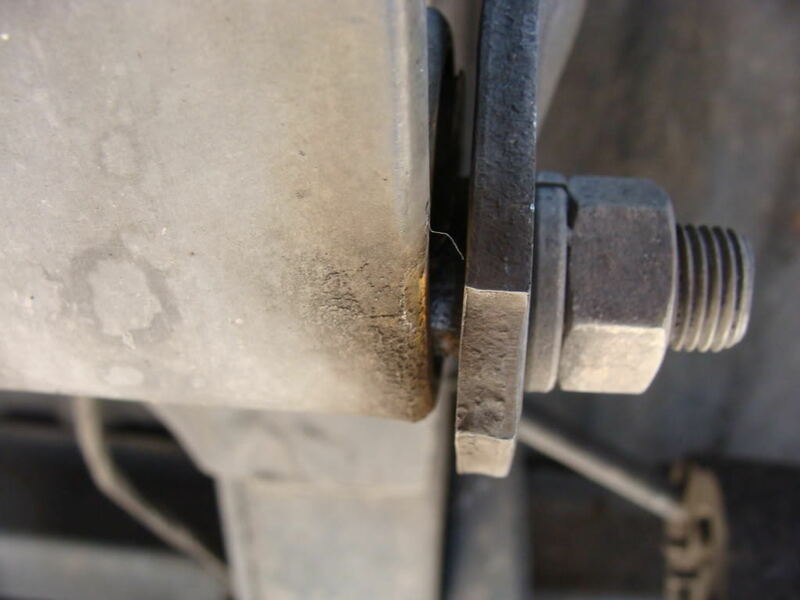 I pried up that stud, cut a rubber seal like a water heater element seals like, and stuck pieces of that under the stud in the gap there when I pried. Then I filled the top gap with silicone RTV. Then I added a $1.14 rubber washer with 1/2 inch i.d. that came from Ace Hardware. Then I had to loosen the big nuts on the U-bolts and pry (very hard) to get the shackle holes to line up to get that on. Then I just tightened everything. I haven't driven it yet to know if that has helped. 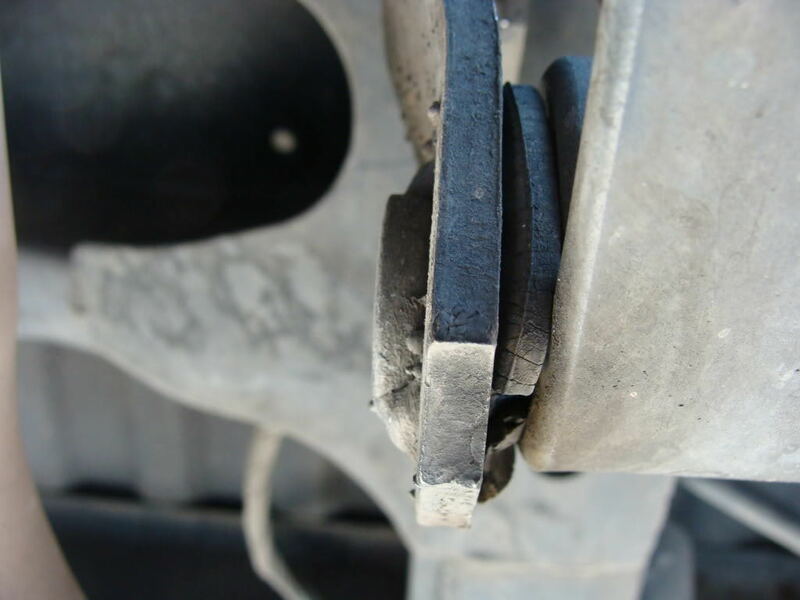 If it does, when my &quot;fix&quot; goes bad, I'll at least &quot;know&quot; it was the leaf spring bushings. So here it is, with the Ace Hardware rubber washer showing, hopefully to restrict/prevent left-right motion. On the other side, it was the inside part that was worn/missing. Since I was fearful of not being able to get that all back together by myself, I just tapped the stud with a hammer, slit one of the Ace Hardware washers, and slipped that in, then retightened. QUESTION: what's an easy or reasonable way to get the second end of the leaf spring lined up so stuff can be slipped on and bolted down? Update: I've taken two trips, one 20 miles, the other 2 miles, since addimg those rubber washers from Ace Hardware, and the noise appears to be completely gone !!! So that means my hypothesis of it being due to rear leaf spring bushings was correct. working on one side at a time usually works for me. jack up the frame on one side in front of the front spring perch till the tire is right off the ground. 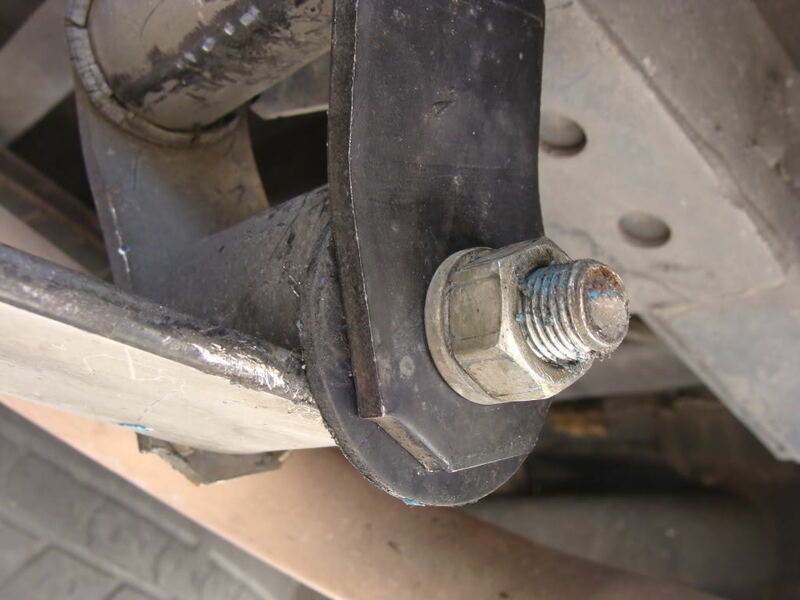 once all the weight is off the spring you can unbolt from axle, take it out and do what you need to do. when reinstalling, it should go right in without too much work. the fronts may be a little tight with the new bushings so using a little white grease will help them along. Jack it up, throw on stands, then you can adjust the height/load of the springs/axle via a jack. They're only under load when they're compressed if that's what you were worried about. Should't have to pry anything, just jack her up and down till it lines up. Good work on the temporary fix!!!!!!!!!! Thanks, Jenko, I wasn't able to find your write up, the key word was shackles !!! I knew if I called it bed shifting I'd get some readers. Nalothane are readily available in your part of the world. I think I found a source in Puerto Rico, USA which shows the same factory numbers on them. And if the last four of the 12 don't fit the front of the leaf spring, then I can get those Moog ones for there. So I'll be ready for when/if my temporary fix fails. I'm mainly just glad it wasn't differential or drive shaft, love these trucks !!! I saw two Ebay listings that actually used the Mazda part numbers in them; one is from Thailand, and one from Puerto Rico. 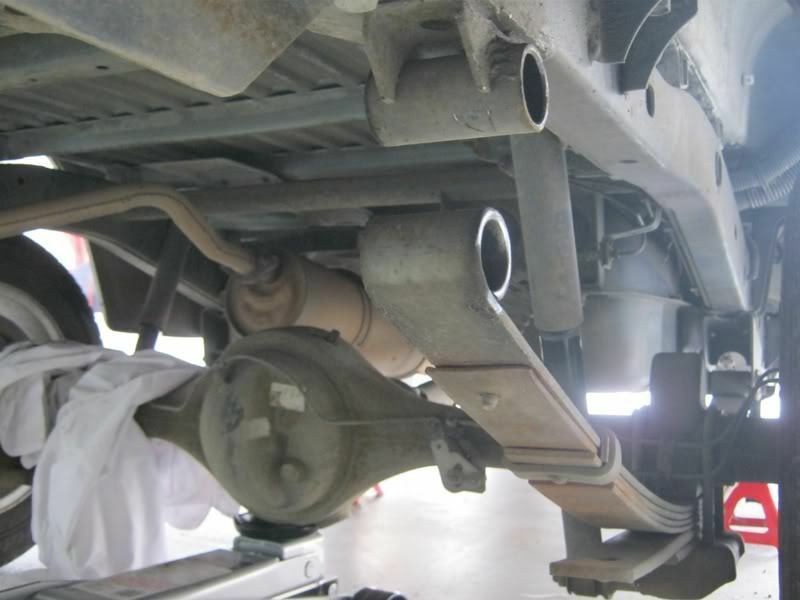 Thanks for the information, yes, you are right,....we just have those (ther rear supensiion leaf spring, and i have to corecct the quantity and the cost of course,now, that part number you gave it is correct,the 3874 28330 it is located on the front leaf spring ends,need 2/per side for a total of 4,we are developing that part in the factory on the next 6 months,we might have that hopefully by that time, now, i can check for you ,if you want to,and tell you how much will cost the three types of bushings,so i will have to re-organize the information on quantity and pricing,of coursr the other ones,(3874283330)will be on a regular rubber material,(the shape it is very similar to the short bushings the difference between both is an inner iron sleeve,but i saw a customer here,that used the old hardware,and replace the black rubber with our product,but that is a particular case in which i won't have experience,any way if you want't me to check for you i will,......thanks for your interest and let me know!...thanks!i have learned something very important on those parts! The part they don't have in the kit can be the Moog part from Rock Auto or O'Reillys. I can't help but notice how &quot;clean&quot; your undercarage is. I live in northern minnesota and they love to use the salt here for the roads and the underside of my truck is completely destroyed! My previous b26i rusted completely off. The left frame rail actually collapsed when I put some sand in the box one day. All are readily available in the states from mazda. Also, they show to fit 86-93 b-series, 2wd and 4wd.